Full of personality. Great color. Fetching pattern. Peaceful. These little gobies are the bees knees. They can change color at will, so they are always fun to watch. 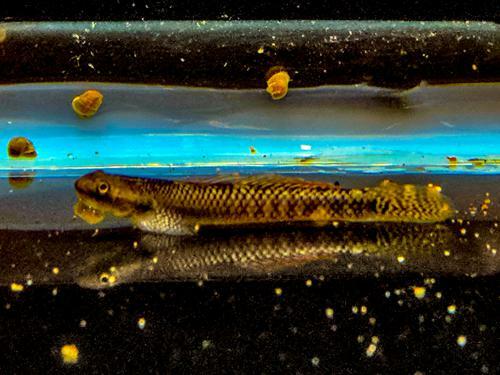 These gobies grow to about 2.5", give or take a bit. They are an amazing and unique addition to aquariums which have other peaceful fish of an appropriate size. These need to be in an aquarium with a good amount of dissolved oxygen. Also, they can climb, so be sure to have a good lid on your aquarium so they don't climb right out of the tank. These fish are grazers and are eating well on flakes, pellets, frozen food, live food and Repashy. They like to graze instead of eating large meals, so Repashy and a well established aquarium are helpful. There are many species in this genus and they are difficult to identify. Most of them seem to be misidentified in the hobby. These specific fish hail from Indonesia, so they are probably an ornatus type, but it would take an ichthyologist to tell for sure.